What do you need for knitting? A common misconception is that once you have yarn, needles, and a pattern, you have everything you need to get knitting. 1) You’ll have to set aside your knitting before you’ve finished it. Possibly before you’ve even finished a row. 3) You’ll need to change yarn colors, so you’ll need to break the yarn. New knitters frequently don’t realize that knitting isn’t just about yarn and needles until, oh, maybe their 2nd or 3rd project. Sometimes they need even longer. Even some experienced knitters, who really should know better, don’t realize that they should probably have all the “extras” they need for knitting in one spot. I call these items “notions.” They’re not yarn, they’re not needles (well, some of them are), and they’re not patterns. But they are absolutely essential to your knitting project. Not all of them are necessary for every project. But at least two notions are completely essential for every project. I’ll get to those in a moment. Keep Those Notions with You! 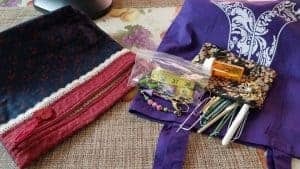 The earlier you can get into the habit of keeping all your knitting notions in one spot, and to always have that spot be wherever your current project resides, the happier you’ll be. And the more knitting you’ll be able to accomplish at any one time. 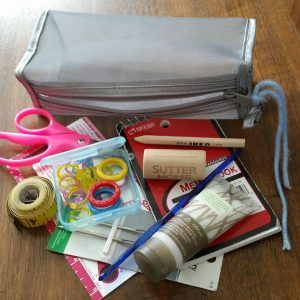 Recently I recorded a live video on Facebook in which I showed off all the contents of my knitting notions bag. You can see this video below! The reason I encourage you to keep your notions with your current project at all times is simply because it’s a time-saver. Nearly everyone I know is pressed for time these days! The less time you spend hunting down your notions, the more time you can devote to knitting. Most knitters keep their notions in a bag. Some folks like to get fancy with these. You can see photos of other knitters’ bags here! As you could see in my video, my bag is super-classy and super-sophisticated. (That is, it’s a zippered plastic bag.) If you don’t want to make or buy a bag, you can easily use that sort of bag. It does the job and it’s cheap! For my money, there are two absolutely essential knitting notions that everyone — EVERYONE — who knits absolutely must have. Why are these essential? Because at the very least, at the end of every knitting project you’ll need to break the yarn, unless you plan to knit until you run out of yarn. But even then, you may find that you have a little too much yarn at the end that you can’t quite incorporate into your project. So even then you’ll need to snip. And at the end of every knitting project, you’ll have ends to weave in. Thus, you’ll need a yarn needle. Yarn needles are sometimes called “tapestry” needles or simply “large-eye blunt needles.” They may be plastic or steel. I personally prefer the steel ones because they’re more durable, less resistant to bending or breaking. But everyone’s different; some knitters prefer the plastic ones. In this category falls items like tape measures, stitch markers, and crochet hooks. The only reason these items aren’t absolutely critical is that, in a pinch, you can substitute other things for them. But from time to time, you will need something that serves their purposes. And trust me, it’s easier if you have them on hand (and in your notions bag) from the start. Tape measures are important because most knitting patterns, at some point, will require taking a measurement. Of course, you don’t have to use a tape measure for this, but it’s the easiest way to get the job done. Stitch markers are often necessary for pattern repeats. Even if a pattern doesn’t specifically tell you to “PM” (e.g., “place marker”), you may find that you’ll make your knitting of a lengthy pattern repeat easier if you place a stitch marker in between them. Finally, a crochet hook is invaluable for picking up a dropped stitch. Certain cast-on and bind-off methods also require crochet hooks. If you’ve dropped a stitch, you can pick it up with a knitting needle (as I demonstrate in the video below, as well as how to pick up a stitch with a crochet hook). In some instances you may find using a needle easier; in others, you may prefer to use a crochet hook. 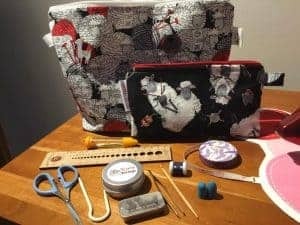 This final category includes items like a needle gauge, point protectors, scraps of yarn, stitch holders, cable needles (or spare double-pointed needles), and even a list of yarn requirements. A needle gauge is one of those items I never would have considered I would have any use for, until one day when I saw it in a yarn shop and decided I HAD to have it. I’ve never regretted it, either! Because either I’m going blind, or else there’s some other reason I’m finding it harder and harder to examine a set of needles and figure out what size they are. I now have two needle gauges, as you can see in the video above. One also has a little ruler that’s extremely helpful for measuring knitting gauge. Point protectors are kind of poorly named, in my opinion. I’ve never really owned needles that needed their points protected. What these useful little doo-dads actually do is keep your stitches on your needles in between knitting sessions! I love keeping scraps of yarn handy, as they serve so many useful purposes. First and foremost, you’ll see “slide stitches to waste yarn or a stitch holder” at least occasionally in knitting patterns. There are some cast-on methods that require scrap yarn that you’ll remove later. And, as mentioned earlier, in a pinch you can tie them in a loop and use them as stitch markers. 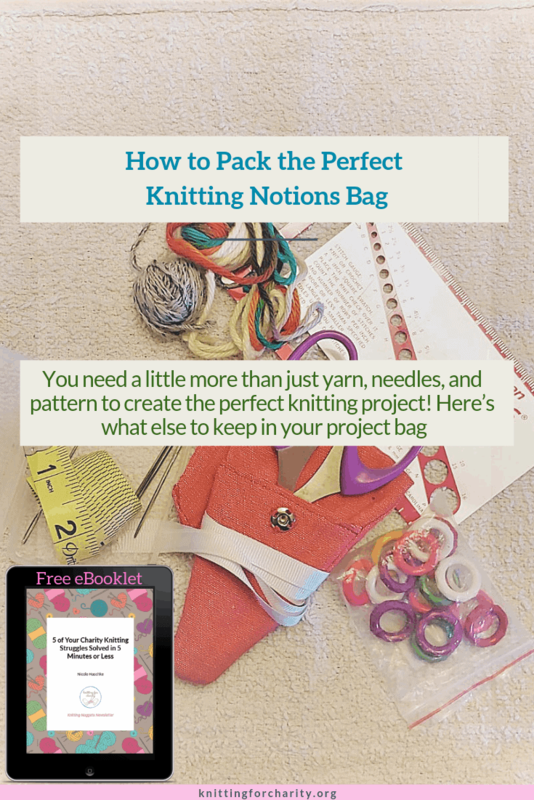 Don’t stress too much about your knitting notions! It’s fine to build it up gradually. You can start with just the scissors and yarn needles. (That’s what I did — my original knitting notions bag was a sandwich-sized zippered plastic bag!) Then you can add more as you feel ready. And again, don’t feel like you need to go out and buy a fancy bag. You can make one if you like, or you can just use simple zippered plastic bags. But whatever you choose, keep those notions nearby. Because trust me — you’ll need at least a few of them for every project! What notions are in your bag? Did I leave any out that you find essential? Leave a comment and let me know! 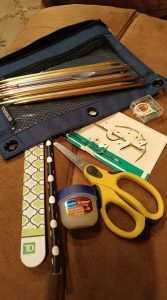 Read more about knitting supplies here on my site! I love you. you are so very true with your information. I think you are wonderful. Since I knit several projects at once, I have several notions bags. I use inexpensive cosmetics bags. They are colorful and sturdy. In each I have scissors, tape measure, chibi full of tapestry needles, also in the appropriate size for the project, I have stitch markers in various colors in both ring and locking styles, gauge checker, post-it notes, waste yarn, and in the projects which grow I have spare cables in various lengths. I also keep a small pack of wet wipes and a travel size hand lotion, dental floss for safety lines, and cable needles if necessary for the project. I have two tips to share. I have a pair of “kindergarten” scissors to take when I travel. They are short & rounded so they travel well & I don’t have to worry about TSA. I put them on a pacifier “leash” that I can clip to my notions bag so I don’t lose them if I drop them in the car or a plane, etc. Also, the plastic color rings from electric toothbrush replacement heads make great stitch markers for travel projects since I don’t mind if I drop one. I always have extras. Kellee, that’s an excellent suggestion re: the “kindergarten” scissors! Especially useful for traveling, indeed. I also like the idea of keeping them on a “pacifier leash.” Interesting thought about the electric toothbrush “rings,” too. Never would have thought of that! Thanks for sharing! In addition to the above, I keep a nail file and hand lotion for the inevitable times that my hands or nails develop a rough spot. Also helpful is a tin of mints & a lip balm. Ah yes! 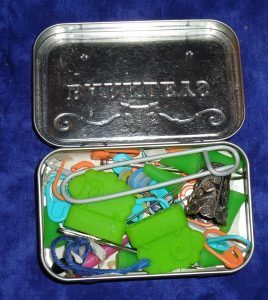 Those are all things I keep in my purse (aside from the mints – I usually have cinnamon gum instead). But good things to keep in notions bags, too! I always have bandaid in my notions bag. And I can’t believe how often they have been used. I also keep a nail file; it gets used frequently. I wish I didn’t believe it… but I absolutely do, Patricia. 😆 I keep both bandaids and nail files in my purse, so I don’t keep them in my notions bag. But, good calls!